(Ocford English Dictionary) butter-and-egg man U.S. slang, a wealthy, unsophisticated man who spends money freely 1926 H. C. WITWER Roughly Speaking 229 A couple of big *butter and egg men from Verona, New Jersey. 1927 Daily Express 31 Aug. 8/7 'Butter and egg man' is an American slang expression practically equal to our term 'greenhorn', that is, a man of money who spends lavishly and is an easy prey of the gold-digger and other unscrupulous persons. Gee, that last part really sounds like a handful of floor traders I used to know! By coincidence the CME was originally named the Chicago Butter and Egg Board when it originated in 1898 and kept the name until 1919 when it was renamed CME. So far I haven't seen any evidence linking the original name of the CME w/this term but my thinking is they're somehow linked. 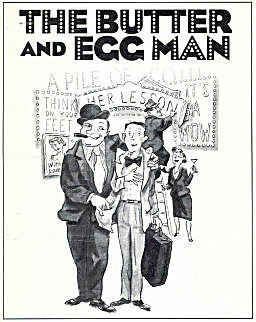 The usage of the term Butter and Egg Man was so widespread that Louis Armstrong recorded a song which captured the spirit of these guys as targets for gold-diggers. So she's got money...when she wants to play"
Seriously I think I'm onto something with the link but no evidence so far!